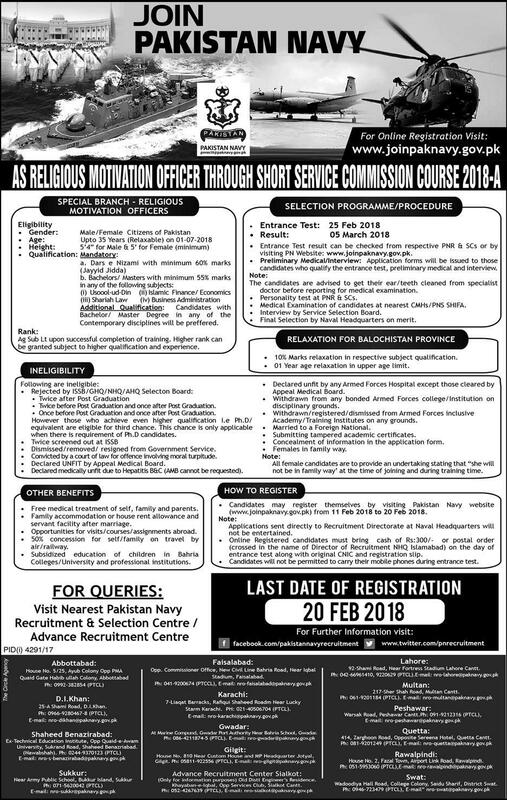 Join Pakistan Navy as religious Motivation Officer through Short Service Commission Course 2018-A. Ag Sub Lt Rank will be granted upon successful completion of training, whereas higher Rank can also be granted subject to higher qualification and experience. Candidates can register/apply online at www.joinpaknavy.gov.pk for latest Pakistan Navy Jobs 2018. Candidates may give entrance test at following Recruitment Centers, Abbottabad, D.I Khan, Shaheed Benazirabad, Sukkur, Faisalabad, Karachi, Gwadar, Gilgit, Sialkot, Lahore, Multan, Peshawar, Quetta, Rawalpindi, and Swat.